Planning a destination wedding can be a breeze with the right wedding planner. So don’t be afraid to explore options outside your comfort zone. For this beautiful couple, they knew they wanted their ceremony and reception on the beach which limited many options for them. 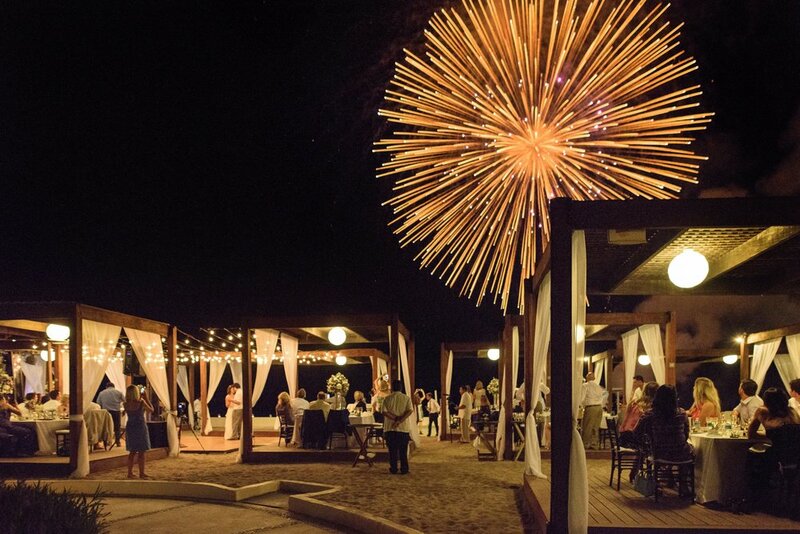 LoLo Weddings & Events were able to negotiate a spectacular evening beach wedding complete with fireworks for less than half the cost of a wedding in Southern California! Since all guests were from out of the country, we expanded the wedding festivities to maximize everyone’s time together. We kicked off the wedding weekend with a Welcome Reception at the Westin Marina Puerto Vallarta Hotel Lobby Bar. Margaritas were flowing and delicious Mexican fare was to be had by all. And to make things more fun, we had all the guests dress in white. The morning of the wedding, the girls went to the Marina for a yoga session to relax and get ready for the big day. They then had an outdoor breakfast with green juice (jugo verde!) and acai bowls. Nice and healthy before all that tequila! haha. We transported guests down memory lane by having every few rows with a photo of Allie and David from a specific time period in their lives….baby photos, first day of school, high school and college….all the important moments that led to this momentous moment for the two of them where their lives merged into one. A woven runner helped guests get to their seats on the beach minimizing the sand in their shoes. A modern white stage and arch with sheer white draping looks gorgeous with the brides complementing wedding dress. Blue agate coasters with gold trim serving as place settings for the bride and groom and matching menus were purposely chosen to set the elegant beach mood and reflect the nearby blue waves. We knew the cake HAD to be purple, the bride’s favorite color, but we wanted to make it a little more eye-catching by doing ombre frosting decorated with purple lisianthus. It looked so beautiful with the colors of the setting sun behind it. Oh, and it tasted Ah-mazing. Ummm every first dance should end with a dramatic dip, kiss and fireworks in the sky, right?? What an amazing and magical moment for these lovebirds! And in Mexico, it’s a FRACTION of the cost as it would be here in LA. Highly recommend! Absolutely EVERYONE was on the dance floor….air guitar and all. People still talk about how much fun this wedding was! It was the perfect mix of beach, elegance, amazing music (handpicked by the Bride and Groom), and FUN! ©2016 Lolo Weddings & Events. All Rights Reserved.